Personal training is one of the best ways to get in shape, but it is a big investment for most people and results are not immediate so it can be many months before you know if you made a mistake. Wouldn't you want to know ahead of time if it is going to be a good investment? My daughters were in competitive gymnastics and cheer for years, and after awhile I got to the point that I could walk into a competition and almost immediately tell which teams were going to be in the finals. It wasn't from watching the athletes either, it was from watching their coaches. The lessons I learned over the years from watching winning coaches carry over to what you should look for when choosing a personal trainer. 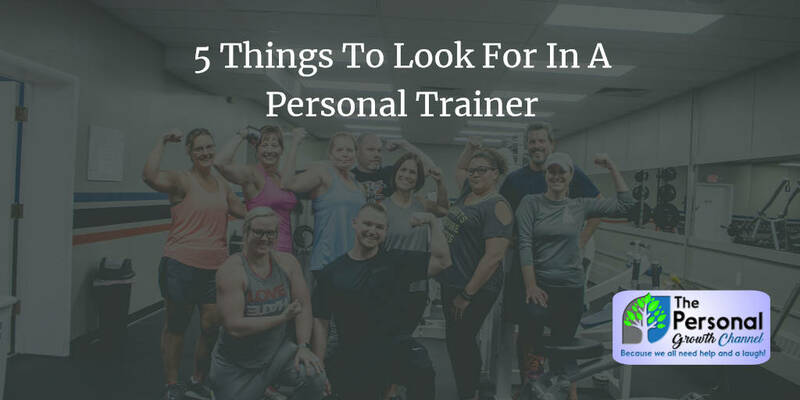 Here are 5 things you should look for in a personal trainer or a coach. Does your personal trainer appear to care about you? Look for little details like them asking a lot of questions about your goals. The best trainers and coaches I've ever worked with truly care about their students and will push them to achieve their goals because they care. Injuries can happen when people are being pushed to their limits even with the best trainers, but good trainers care and have a way of doing things safely that minimize those injuries. Ask your trainer how they minimize injuries and pay attention to how many questions they ask about your goals. Does your personal trainer have a good reputation? Look for reviews online, on Facebook and Google. Better yet, talk to some of their current students and ask about their experience. Do they have a reputation for being a good trainer? If you get enthusiastic responses to those queries, there's a pretty good chance you've found a good trainer. I almost said that a good personal trainer should be passionate about what they are doing, but perhaps a better way to say that is that they believe in what they are doing. A coach or a trainer doesn't have to be bubbly and passionate all the time to be a good one, although that may help keep you motivated. What they do need is to fully believe in what they are doing. You can see this in how they talk and how they live their lives. Ask yourself, do they truly believe that health should be a way of life? Does your personal trainer look like what you want to look like? While there are exceptions to the rule, you usually want a trainer that looks like they spend time in the gym and eat healthily. If they don't practice what they preach, there's a disconnect somewhere. Ask yourself if this trainer or coach appears to practice what they preach. Know how I always knew which teams would win during our competitions? I would look for the coaches that were constantly giving feedback to their students. Point that toe, straighten that arm, not like that do it like this (demonstration of technique). They weren't yelling at their students or putting them down, they were simply giving them regular feedback. Winning coaches constantly gave feedback to their athletes during practice. The book The Talent Code: Greatness Isn't Born. It's Grown. Here's How., which is an in-depth study on how talent is formed, found this habit to be the biggest distinguishing factor between coaches who consistently produce world-class champions, and those who were merely ok. When looking at a personal trainer, you should try to see them in action. Are they correcting people's form? Are they involved? Or did they scribble something on the board and go off in the other room while their students struggle through the workout on their own? This feedback was what I looked for in order to figure out which team was going to the finals. Coaches who paid attention to detail and gave regular feedback to their athletes were consistently the ones whose teams won. If you look at nothing else when selecting a personal trainer, look for a personal trainer who pays attention to the details. Like the article? Make sure to share and sign up for our weekly newsletter to stay motivated! Good luck on your fitness journey!